This card was really quick to make. Why? Because all the elements came from the same collection of papers and embellishments, so all the coordinating was already done for me. While I love pulling different patterns and colors of paper together, and rooting through my box of embellishments in search of the perfect one, sometimes it is nice to go with what has already been grouped together by the wonderful scrapbooking companies out there. I find using one paper collection an incredible time saver when I need to get a card made rather quickly. I don't have to think about 'what goes with what' and can just focus on the design. 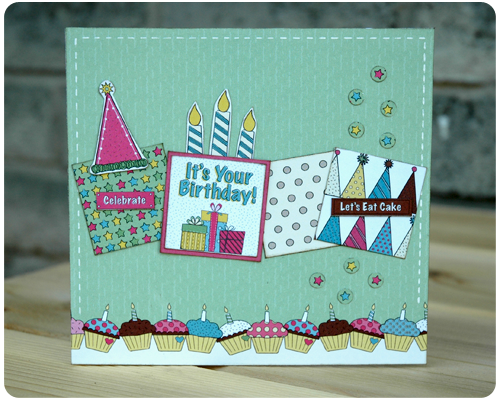 What about you - do you always match papers and embellishments yourself or do you take advantage of collections?